There has been so many things exciting about moving into a new neighborhood. There are the finding new ways to work (my commute has been reduced to 4 miles each way! ), discovering new walking routes to get my exercise in and discovering new eateries to check out. While I’m not entirely unfamiliar with my new neighborhood of Kearny Mesa, shopping centers I once dismissed when we lived in Hillcrest are now regular potential sources to fill our tummies. One of these places is Balboa International Market. 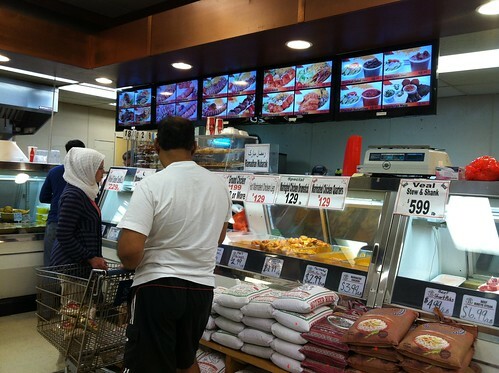 Along with carrying a stock of Middle Eastern groceries, they also have a hot food counter located in the back. If you’re any way familiar with the glorious Wholesome Choice in Irvine, this market is its smaller, scrappier sister. There are less choices and only one hot food option but it fills in the niche until you can get to back to Irvine. Beef, chicken and fish plates are available along with hamburgers for the less adventurous. 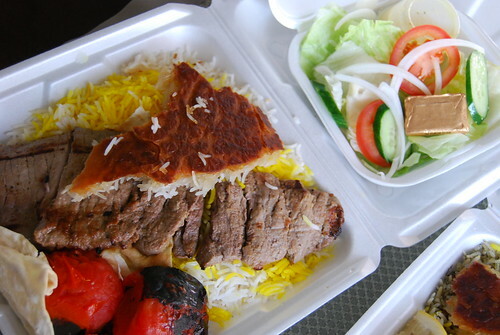 Regardless of protein, every plate is accompanied with a generous serving of basmati rice, flat bread, one or two roasted Roma tomatoes and generic side salad with an addictive mustard-based sauce. While prepping your order can take a while, it leaves you with plenty of time peruse the store. On my last visit, I counted over 20 varieties of rice and stared slack-jawed at a goat head ready for purchase at the butcher counter. (For the less squeamish, you can view the meat counter contents here.) 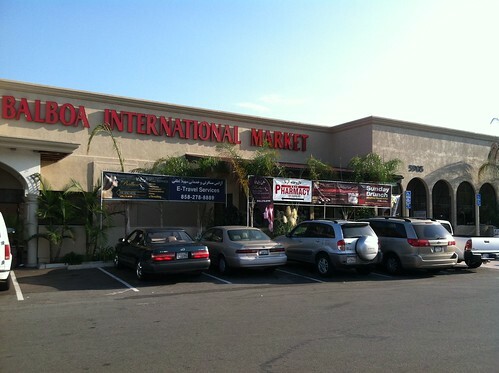 Balboa International Market also carries certified hand-slaughtered Zabiha Halal poultry. 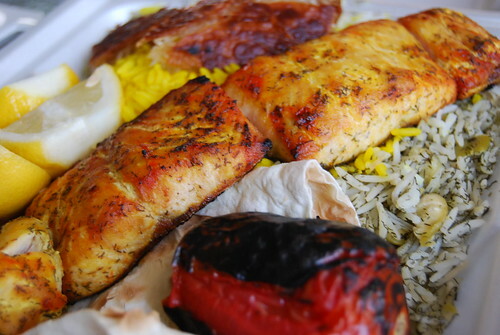 The seasoning on both the grilled salmon (salmon kabob, $12.99) and filet mignon (barg kabob, $14.99) were spot on but the tenderness of the beef left much to be desired. It was tough unlike the fork-tender version at I was accustomed to. In addition, the fish was overcooked and dry. Maybe the grill cook in the back was having a bad day but otherwise everything else in the container was top notch. I could foresee myself going to Balboa International Market for the sides alone. Everything is packed in a styrofoam container and can be eaten at their outdoor patio or transported home. Lucky for me, home is less than a mile away. Hi Darlene, hope you guys are doing well. Really like it here, I actually was back twice recently after a long dry spell. The burnt rice is called tadig. I ask for it at the counter (like many do) so to make sure I get some, limited in quantity it’s kinda of a first come first serve and they can run out. The tadig from the dill and lima bean rice is especially tasty. Thanks for that bit of information, Dennis! It sounds so much better than “crispy rice bit.” And yes, the tadig dill and lima bean rice is the best! This is a market I haven’t explored yet. Good to know about the “tadig”. I love rice crust! Oooo… call me if you’re in the area. I might join you. Will do! Instead of Donut Star, it will be Balboa Int’l Market! I tend to like sides better than a main dish. Oooh, when I was a kid, my grandma used a cast iron pot to make rice and occasionally it would get a little crispy on the bottom and we would all “fight” for it. Yummy! Can’t get that from an electric rice cooker. That’s true! There are no crispy bottoms when using rice cookers. I guess I should be glad I gave mine away (to my mom’s astonishment). i live across the street from this market and its always been in heavy rotation. the chicken they sell with the yellow/orange marinade is amazing when you throw it on the grill and pair it with some of the huge bread they sell in the bakery and some of the yogurt sauce from the deli. its a cheap and easy bbq. Thanks for the great recommendation. I will have to get some chicken next time to grill! Ohhh! I love that market, have only been a couple times and always stock up on their red pepper puree and feta cheese. The deli smelled ahhhmazing and now I need to go and try their rice dishes. I’ll make it a carb-filled dinner. I certainly have to pay more attention to the market especially since I’ve been on a feta cheese kick lately. 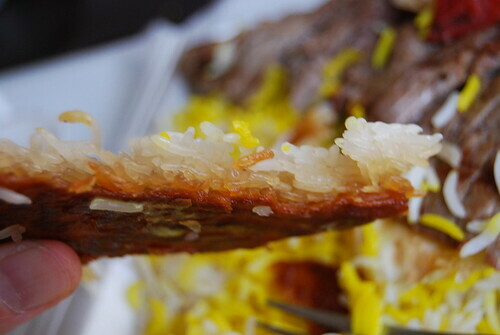 The crispy rice looks good! Amazing there’s so many varieties of rice available.